Thanks to all of you who came to the event, was great seeing familiar faces, and also seeing new ones. We hope you enjoyed the event, we got great feedbacks on the venue (Mandy's) and its location, so we might use it again for next times as well. 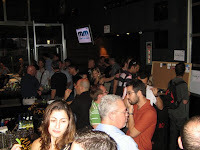 Looking back, since we launched MoMoTLV, we had 3 events with an attendance of 100+ people on each event. But that's not enough for us, and we're already planning the next event, which will probably have some guests from abroad and ought to be very interesting - we'll release more details as they become available. As usual you can see the pictures from the event in our gallery (more pictures will go up later on). Also, the presentations from the event will be available soon here, so stay tuned. We would also like to remind you that you can use the google group for just about anything related to the mobile industry: business questions (which companies give service X), technical questions, job postings, "philosophical" debates about the state of the local/global industry and other stuff - feel free, the discussion board is here to use it. The strongest MoMo chapters usually have very active boards, and so should we! Thanks again to our annual sponsors Partner Communications (Orange Israel) and BlueRun Ventures, our new annual sponsor Amdocs, and the event sponsor Eurocom (Nokia Authorized Distributer in Israel).